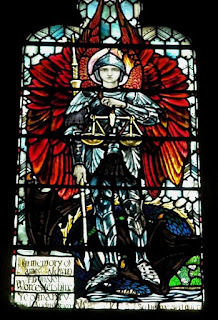 Welcome Archangel Michael, whose name means "Who Is Like God"
Today is the Autumn Solstice, and marks the beginning of a new season for growth. A time for shedding the old to prepare for the new, while balancing the physical and the spiritual. Your dreams will often reveal a lot about your values. So you may want to pay closer attention. Autumn also brings with it testing of the lower consciousness, regarding our judgment. When we pass these tests, there will be spiritual rewards. We have access to spiritual guidance during this time (felt strongest through contact with nature). This morning, while weeding the garden, I spotted a magnificent flock of young herons flying in formation high above me. And, then later, on a drive, seven ibis were patiently sitting on the power cables overlooking the ravine. Usually these birds are on the ground, pecking away for food. Ibis has to do with communications and writing, and herons are about aggressive self-determination and self-reliance. Archangel Michael offers his dynamic assistance to provide protection and balance. With his mighty sword, he will cut away, and purify what is no longer serving you. The Feast of Saint Michael is held during the autumn on September 29. Archangel Michael is available for every seeker on the spiritual path. He is the Archangel in charge of change, and brings the gift of patience. Often known as the Dragon Slayer as well as the Prince of Light, he helps us to face our own personal dragons that we have pretended do not exist. The dragon is associated with our lower self, our fears. Archangel Michael aids in transmuting shadows into the light of new beginnings. With his help, this can be a beneficial time to take courage and make new decisions that will lead to more freedom of expression for the highest good of all. So remember to make the call for Archangel Michael's help in areas where you need more courage to face your fears. Happy Autumn Solstice! What messages is nature sending you today?